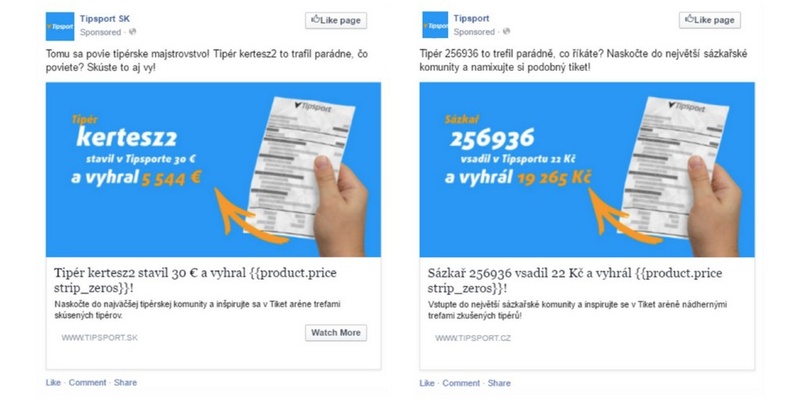 Tipsport is the largest go-to sports betting agency in the Czech Republic, swiftly transitioning into the digital age with the help of Facebook Ads and ROI Hunter. Create a campaign that would not need to be restarted, readjusted or otherwise manually managed and could run on Facebook long-term. Automation allowed to achieve that and cut cost per lead (CPL), getting higher overall results with smaller budgets. Generating Data: Use Tipsport’s CRM client base, converting it into a valid Facebook Feed, adjusting & updating graphics automatically, creating dynamic ads for new user acquisition. Simple Design: Our Feed Manager allowed us to tweak the feed according to Facebook requirements - right tags and naming conventions. Ideal Images: For Facebook-ready creatives Tipsport employed ROI Hunter’s Template Editor, using a graphic template to transform images from the database into ads. Bonus points: unlike your graphic designer, our Template Editor never sleeps. Once a valid feed was in place, a dynamic prospecting campaign with age- and interest-based targeting was set up. The wide targeting attracted brand new users, exposing them to native-style in-feed posts that seamlessly blended into their Facebook experience, collecting leads by displaying notable recent Tipsport winners. This updated approach created fresh ads automatically, cutting out manual campaign management and refreshing ad content and copy when necessary. Tipsport Dynamically updated ads, avoiding ad fatigue and allowing Tipsport ads to be displayed more frequently without affecting click through rates. Higher CTR in turn helped decrease advertising budgets and buy twice more advertising. The number of ads that could be run simultaneously and campaign volume increased dramatically, saving valuable marketing time. "Thanks to ROI Hunter’s Feed & Template Editor this unique strategy for using dynamic ads reduced our campaign management hours, creating dynamic advertising that outlasts static ads. Now we can export data into a valid feed and keep the high visual standards with the graphic templates in place." NEXT: Citroen - Use Lead Ads to Generate Sales and Lower CPL!